When it comes to your health, being proactive is key. If you are living with diabetes, you want to be prepared in case an emergency situation strikes when you least expect it. 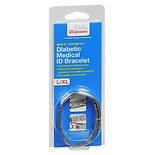 At Walgreens, we carry diabetes bracelets, simple and subtle accessories that you can wear daily to maximize your safety no matter where you are. Prepare for a medical emergency before it happens with a diabetes bracelet. These simple products give you and your family peace of mind. What Is a Diabetes Bracelet? The premise behind diabetes bracelets is simple. Wearing a bracelet every day can help alert medical personnel or those around you to your condition in case an emergency arises. If your diabetes leaves you unable to speak for yourself, these bracelets can do the talking for you. They provide important information about your condition, without being intrusive or burdensome. Diabetes bracelets are made of durable stainless steel. No matter the style of bracelet you choose, each one comes pre-engraved with the word "DIABETIC." The stainless steel plate is approximately 2 inches by � inch. Weighing just 14 grams, this bracelet is lightweight, and you might even forget that you are wearing it. Some people wear these bracelets just like they do jewelry. It is easy to put on with a claw clasp. Diabetes bracelets come in two sizes: small/medium and large/extra-large. Links can be removed from the bracelet chain to ensure a snug fit. Wearing the bracelet snugly -- but not too tightly -- against your wrist ensures that the engraving is preserved. 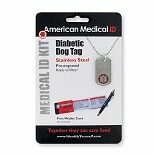 Alternatively, you can choose an ID dog tag emblazoned with the word "DIABETIC." This dog tag can be worn under your shirt thanks to its one-size-fits-all 24-inch chain. With your purchase, you will receive an expandable wallet card, where you can write your specific medical details in case of emergency. These handy wallet cards come with both the bracelet and dog tag style. These stainless steel items are durable, but proper care is important to ensure their longevity. 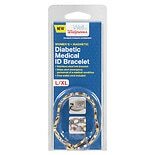 Make sure your diabetes bracelet or dog tag does not come into contact with household cleaners, especially those that include ammonia or chlorine.